Dr. Loucks & Dr. Greenhow joined the esteemed faculty in the Medacta Orthopedic Research and Education Institute Symposium, Oct 7-8, 2011, and presented on the topics of anterior approach minimally invasive hip surgery and patient specific knee replacements to the audience of attending surgeons from around the world. Dr. Greenhow & Dr. Loucks are featured in the current edition of Health & Wellness Magazine: Boomer Edition discussing the benefits of the anterior approach to hip replacement surgery. 1/6/13. 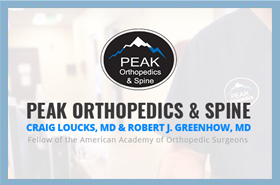 Hiker from Taos researched her options and decided on Dr. Robert Greenhow at Peak Orthopedics and Spine. New technology and implants create an alternative to knee replacements. 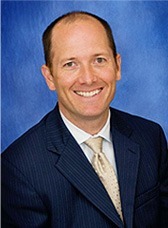 Article featuring Dr. Craig Loucks and the ConforMIS knee technology. Dr. Loucks discusses knee resurfacing and partial knee replacement. See a story including a real live patient testimonial using the ConforMIS partial knee technology. MAKOplasty® Partial Knee Resurfacing is an innovative treatment option for adults living with early to midstage osteoarthritis (OA) in either the medial (inner), patellofemoral (top), or lateral (outer) compartments of the knee. Aurora 8 NEWS 4/19/05 - "MIS Hip Replacement Story"
Recent TV news story featuring Drs. Greenhow and Loucks and their involvement in MIS Total Hip Replacement. An article featuring Dr. Rob Greenhow and Dr. Craig Loucks outlining why anterior minimally invasive hip replacement is easier on patients than the conventional approach. ONE Magazine Fall 2007 - "Operation Boomeritis"
Recent article highlighting Drs. 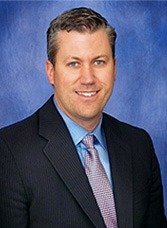 Greenhow and Loucks involvement with computer navigation, robotic-assistance, and minimally invasive techniques for total knee and hip replacement. HealthONE Magazine Spring 2006 - "New Joints for Baby Boomers"
Recent article featuring Drs. Greenhow and Loucks, and their involvement in the latest evolution of hip and knee joint replacement. Health Connection Fall 2005 - "Could a Minimally Invasive Hip or Knee Replacement Change your Life?" Recent article featuring Drs. Loucks and Greenhow, and their involvement in minimally invasive joint replacement. Aurora Daily 4/4/05 - "Minimally Invasive Anterior Total Hip Arthroplasty"
Recent article featuring Drs. Greenhow and Loucks, and their involvement in minimally invasive joint replacement. Aurora Sentinel 4/13/05 - "Minimally Invasive Anterior Total Hip Arthroplasty"
Denver Post 9/23/04 - "Minimally Invasive Joint Replacement"
"A major breakthrough. New minimally invasive operations often let patients go home the same day". Recent article featuring Drs. Loucks and Greenhow. Drs. Greenhow and Loucks developed the minimally invasive joint replacement program at Centennial Medical Plaza. At present, these procedures are now performed at Centennial's sister hospital (The Medical Center of Aurora North Campus) and Parker Adventist Hospital.